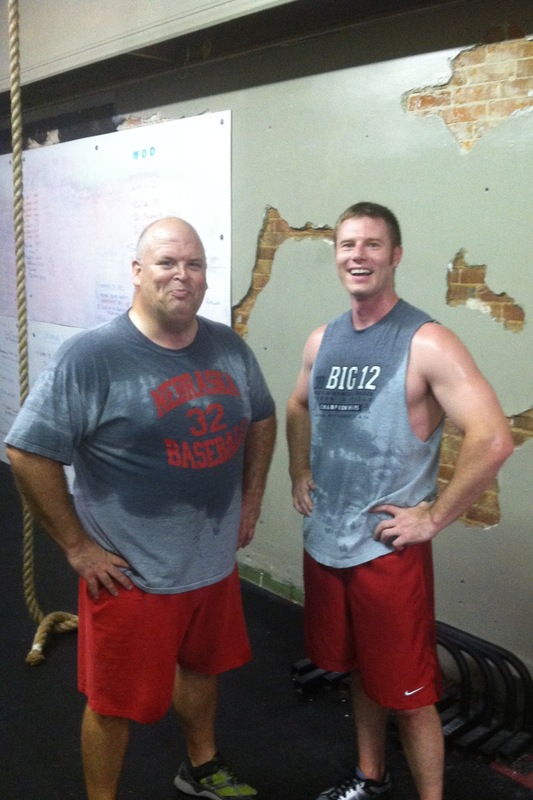 The guy on the right is the one who deadlifted 460 pounds Wednesday at Warrior Crossfit Muscatine. It’s best to just compete against yourself at Warrior Crossfit Muscatine. At least that’s my story and I’m sticking to it. Wednesday, I briefly felt pretty good about myself. I had just set a new deadlift maximum for myself of 315 pounds, up 10 percent from the 285 pounds I lifted in June, according to this blog. But I’d no more than dropped the weight to the floor with a loud clang, when Ryan Wilson lifted 460 pounds — enough weight that I’m pretty sure he couldn’t have put any more plates on his barbell. He made it look easy. According to livestrong.com, I should be able to deadlift somewhere in the neighborhood of 420 pounds, which, I guess, is a goal for the future. The deadlift is a staple of most weight rooms. The world record is 1,015 pounds, which was lifted last year by Benedikt Magnusson of Iceland. It’s unlikely I’ll ever get to that level, but I’d like to catch up with Wilson, 32, who has been working out at WCFM since July. In that time, Wilson, who works out two to three times a week, says his deadlift has increased 19 percent. Wilson, who grew up in Fremont, Neb., graduated from Iowa State University in 2003. For the past nine years, he has been an engineer at Muscatine Power & Water. He and his wife, Sarah, who teaches math at Muscatine High School, are expecting their first child in April. It’s likely that Wilson lifts heavier weights than just about everyone at WCFM. But working out there has done more for his cardiovascular system than it has his strength, Wilson said. “The muscle up was a big goal for me,” he said. There’s a lesson in that. If Wilson can achieve his goals at Crossfit, so can anyone else who is willing to work hard enough to do it. And that includes me. One of these days, I’m going to throw around as many plates as Wilson did Wednesday.